Magnesium Citrate Powder (Pharmox) is a highly bioavailable form of Magnesium and contains no excipients or fillers. Magnesium is a mineral that is critical for energy production and metabolism, muscle contraction, nerve impulse transmission, and bone mineralization. 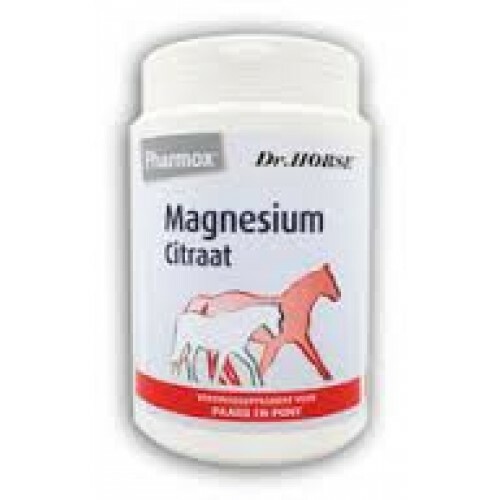 Modern diets are often low in Magnesium, and the high stress lifestyle of some horses leads to an increased need for Magnesium (traveling, breaking, training, competition etc. ), Calcium-rich diets can also create an imbalance. this can cause low magnesium levels. Low magnesium levels mean that calcium is allowed to overload the muscle and nerve cells making the nerves overly sensitive. Hormonally, there is an increase in levels of stress hormones, notably of adrenaline and cortisol. Some horses and ponies show symptoms of Equine Metabolic Syndrome (EMS) or Insulin Resistance (IR). These conditions are characterized by lumpy, abnormal fat deposits on the neck, above the tail head and on the shoulders. These horses respond well to additional Magnesium in their diets. The extra Magnesium works best if it is given when the horse is on a low glycemic diet and, if possible, in a regular exercise program. 10 grams (4 scoops) once daily over the food. 5 grams (2 scoops) once daily over the food. Homeovet Turella Yeast is an important food product for sport horses in training horses with growth disorders (castration), low power and muscle building.